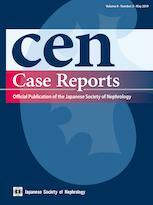 Clinical and Experimental Nephrology (CEN) Case Reports is a peer-reviewed online-only journal, officially published biannually by the Japanese Society of Nephrology (JSN). The journal publishes original case reports in nephrology and related areas. The purpose of CEN Case Reports is to provide clinicians and researchers with a forum in which to disseminate their personal experience to a wide readership and to review interesting cases encountered by colleagues all over the world, from whom contributions are welcomed. Submitted manuscripts will be reviewed by two experts. CEN Case Reports operates a single-blind peer-review system, where the reviewers are aware of the names and affiliations of the authors, but the reviewer reports provided to authors are anonymous. Peer review is conducted using Editorial Manager®, supported by a database of international experts. This database is shared with the journal, Clinical and Experimental Nephrology.